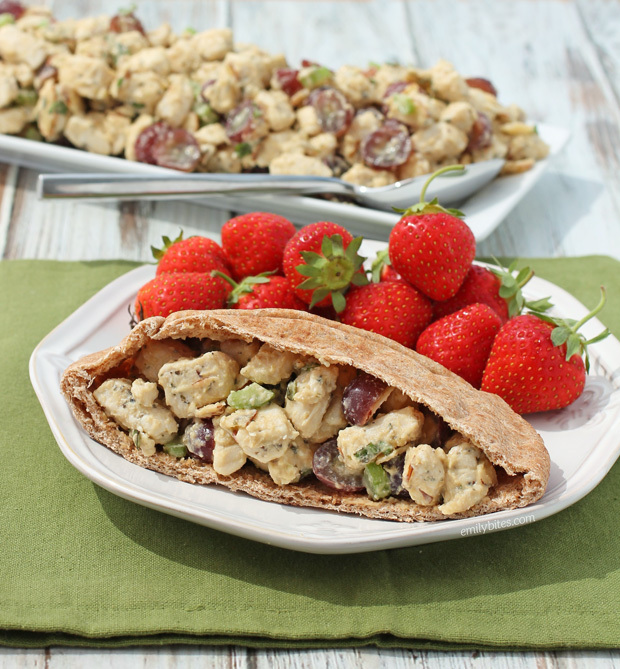 Upgrade your lunch with this twist on a classic, Hummus Chicken Salad! You’ll be amazed at how the rich, fresh-tasting Lemon Twist Hummus pairs beautifully with all your favorite chicken salad flavors. My favorite chicken salad has red grapes, celery and sliced almonds, and with the lemon in the hummus I thought basil would be perfect as well. The result is savory and sweet with some crunch from the almonds and celery. It’s so addicting! Once you make this, I doubt you’ll go back to mayo. If you follow me on Instagram, you probably already know that last month I got to join a group of fellow food bloggers on a trip to Richmond, VA to visit the Sabra* factory, see how hummus is made, taste all the different varieties and learn more about their products. I was in hummus heaven! 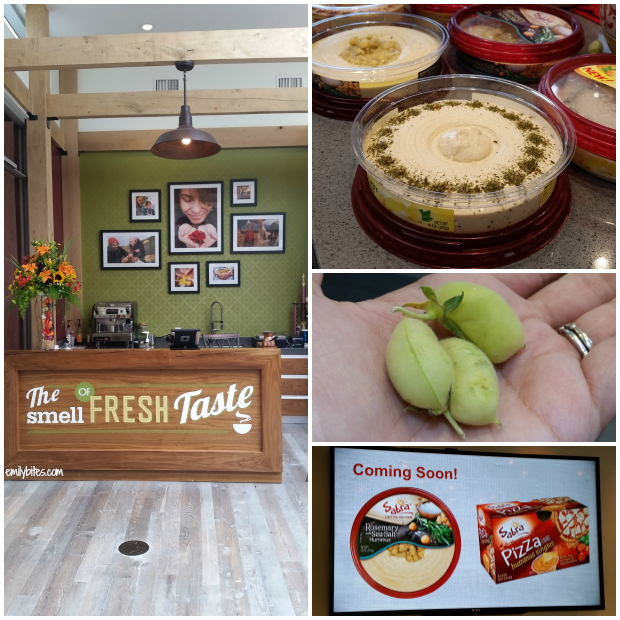 First we learned a ton about the products and the company and I was really surprised to learn how many Americans say they haven’t tried hummus yet – what are you waiting for? Not only is hummus great for dipping, it’s also wonderful for topping, mixing and cooking. Give it a taste! 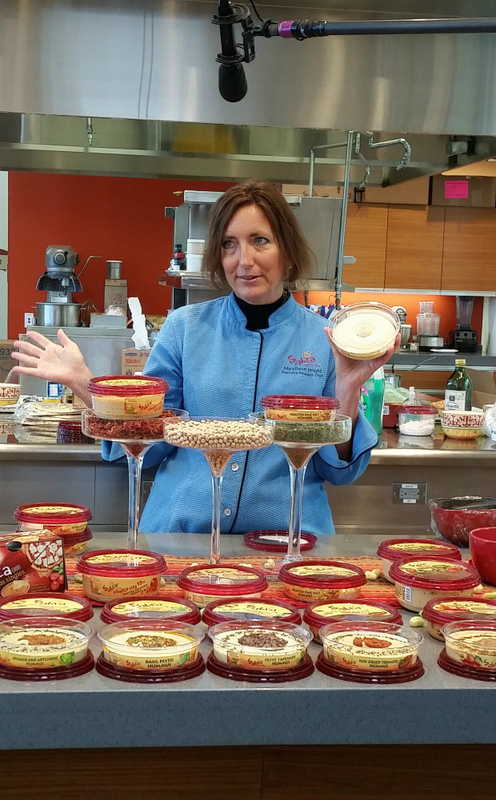 Hummus, chickpeas and new flavors coming soon at the Sabra factory tour! The factory was really neat, we had to put on a ton of gear for sanitation reasons and it was interesting to see the whole process of how the hummus is made and packaged. Though Sabra also makes salsa, guacamole and Greek yogurt dips, each product type has their own factory located near where the main ingredients are grown (for maximum freshness). So while the hummus factory is in Richmond, the guacamole is made near the avocados in Mexico, the salsa is made in California and the Greek yogurt is made in New York. I was also surprised to see they only make one flavor of hummus at a time, so different days you will see them making different flavors. We also got to go to the Sabra test kitchen and meet with their Executive Chef, MaryDawn Wright, who taught us the difference between taste and flavor and allowed us to sample Sabra’s entire product line. Needless to say, this was my favorite part! Lemon Twist has unseated longtime love Roasted Pine Nut as my favorite hummus flavor, but I was also pleasantly surprised by how much I liked the Pizza hummus they have coming out soon (keep an eye out this Fall!). 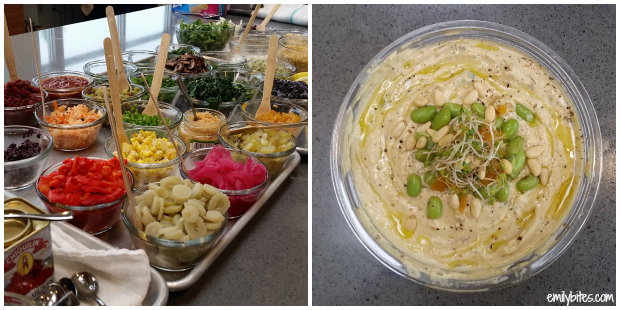 Sabra even let us invent our own hummus flavors in the test kitchen and provided us with tons of fun mix-ins and toppings. I love citrus and was still swooning from the Lemon Twist hummus I used in this Hummus Chicken Salad, so my signature hummus was flavored with fresh lemon juice, lemon olive oil, lemon and lime zest, basil, black pepper and topped with Meyer lemon, edamame, pine nuts and sprouts. Not to pat myself on the back, but it was divine. For lunch in the test kitchen we had delicious seasoned chicken and steak and I topped my chicken with my new favorite, Lemon Twist hummus. It was the best combination, and it inspired me to make the chicken salad recipe you’re seeing here today. This Hummus Chicken Salad can be served in a pita, a lettuce wrap, on a bed of greens or simply on it’s own. It makes for a filling, delicious, protein-packed, low carb lunch and it comes together in a snap. Whether you’re a seasoned hummus-lover like me or you’re a hummus-newbie, this recipe is a perfect way to enjoy this rich and savory treat. *I have partnered with Sabra as part of their 2015 Tastemakers Panel. I have been compensated for my time commitment to work with their product, however my opinions are entirely my own and I have not been paid to publish positive comments. In a large skillet, bring the olive oil over medium-high heat and add the dried basil, oregano and fennel seeds. When oil is hot, add the diced chicken and stir until coated with oil and herbs. Cook, stirring occasionally, for 5-7 minutes until chicken pieces are cooked through. Remove to a container and allow to cool. Place in the refrigerator until chilled. 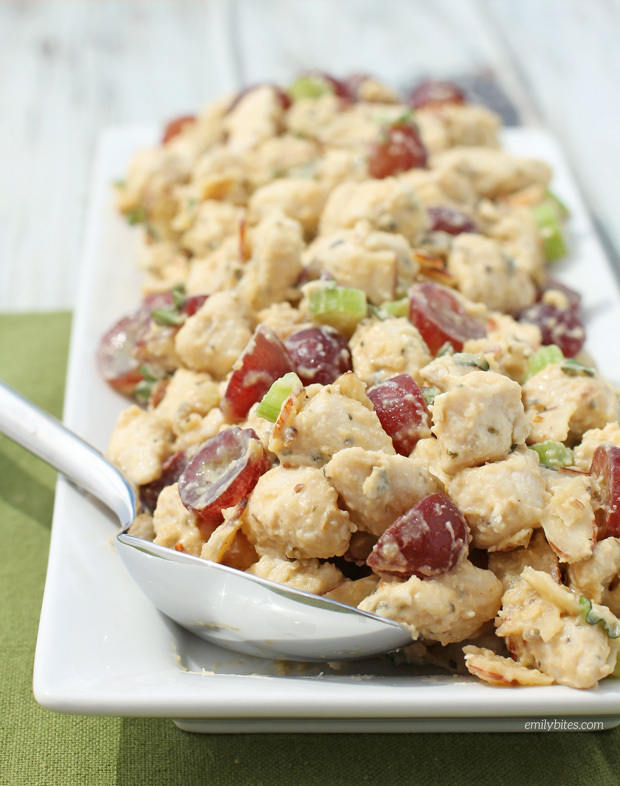 When chicken is completely cooled, transfer it to a mixing bowl and add the grapes, celery, almonds, basil and hummus. Stir lightly until well combined and serve. Looks delicious. Can’t wait to try, but will likely use a comparable Tribe flavor as I find them to have less calories and fat with still great taste. I can not wait to try this! Your Avocado Chicken Salad is one of my favorite recipes! I’m sure I’ll find this one just as good! I’m obsessed with your blog. I pretty much make at least one of your recipes each week. Oh goodness, I can’t wait to try this! I love chicken salad and I LOVE Sabra hummus, so I know this is going to be amazing! Thank you for all your awesome recipes, Emily! LOVE this! Such an inventive recipe! I just got on the Hummus train and my fave is the roasted pine nut, but acccording to your pics above, I see a new flavor of Rosemary and Sea Salt!? Sign me up! Stupid question – I’ve not been able to find the Lemon flavored hummus. (where I live, we don’t have the overly special flavors… yay for living in the boonies! lol!!) Would it ruin the hummus if I squeezed lemon juice into plain garlic hummus? I just made this and I’m addicted! I’m not a huge grape fan but I substituted a handful of dried cranberries for them and it was delicious! Thanks for a great recipe! Omg! This was so good! I found your site tonight when re-starting weight watchers after the birth of my first son. I’m blown away by how delicious it is. Thanks so much! Looking forward to using your recipes while trying to get my weight back on track! I’ve been avoiding looking at my WW app since the SP switch. I was frustrated that I had gotten the hang of something and then they changed it all up on me. I especially am frustrated with the new web site interface. This recipe made me strengthen my resolve to figure it out and get back on track. It’s delicious. Thanks for sharing! This was delicious! I couldn’t find lemon hummus so I just bought plain hummus and squeezed in lemon juice and it worked just fine! I personally will not add fennel seeds in next time as I am not a huge fan of the flavor of fennel, but I wanted to give it a shot. I wrapped it in 2 ole tortillas for a filling 7sp lunch. Thanks for the delicious recipes, Emily!